The tail end of the Red Sox team equipment truck crosses Yawkey Way outside Fenway Park, Feb. 5, 2018, in Boston. The truck was headed to the team's spring training facility in Fort Myers, Fla.
Boston city officials made the controversial decision Thursday to rename a street named for the late owner of the Red Sox baseball team because of his perceived racism. Yawkey Way runs just outside Fenway Park and will revert to its original name, Jersey Street. It had been renamed for Tom Yawkey, who owned Major League Baseball's Red Sox from 1933 until his death in 1976. But the Red Sox was the last major league baseball team to put a black player on the field when it signed Pumpsie Green to a contract — 12 years after the legendary Jackie Robinson broke the sport’s color barrier and long after every other team had hired black players. Critics say it was Yawkey’s contempt for African-Americans that kept blacks off the Red Sox. “The spirit of Boston, I think, is being renewed to the city that I knew when I grew up in this area as a very welcome one,” said Walter Carrington, former head of the Massachusetts Commission Against Discrimination. 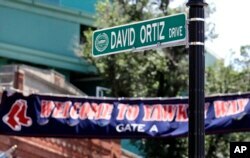 A new "David Ortiz Drive" street sign is posted outside Fenway Park, after a ceremony where part of Yawkey Way was renamed, June 22, 2017, in Boston. Ortiz's No. 34 was retired in a ceremony prior to a game later that day. ​But those who wanted to keep the street named for Yawkey say he was a philanthropist whose charitable foundation helped thousands of people, including children of all races. “Tom and [wife] Jean Yawkey treated everyone alike. Through the Yawkey Foundation, they left almost all of their wealth for people in need, regardless of their color,” a foundation statement said. The name change is the latest high-profile decision by officials of U.S. cities to scrap monuments and statues that critics say honor racists, including monuments to Civil War Confederate generals across the southern U.S.